Teaspoon, 18/0 Stainless Steel, Extra Heavy, Mirror Finish, Continental Pattern. 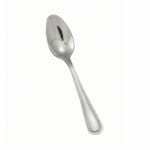 "I really like these teaspoons except they would be perfect if about 1/2 inch longer. Price was excellent!"